The apartment is on the 17th century. 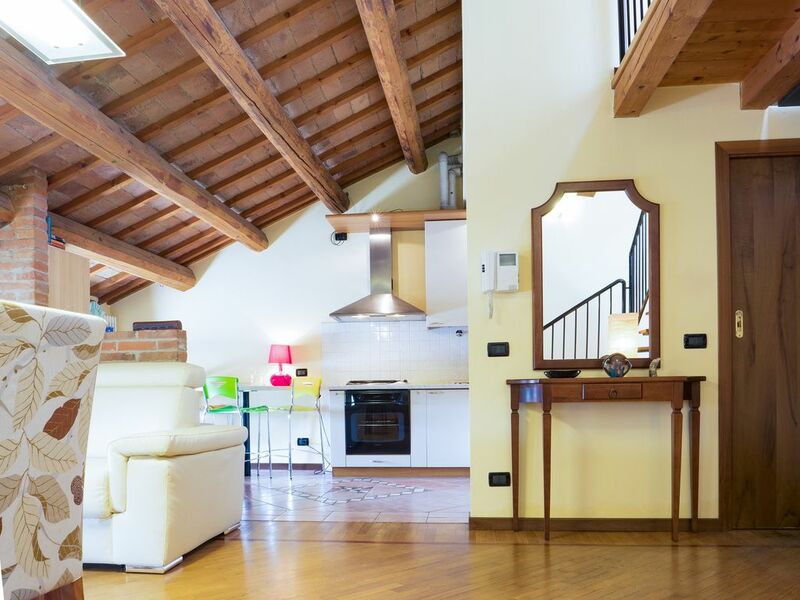 Elegant Apartment overlooking Montagnana's main Square. The apartment is on the top floor. A unique and relaxing position. Montagnana gives you the immediate feeling of a special place as you enter one of its four arched gateways. Inside the medieval walls, Piazza Vittorio Emanuele II, the place where its citizens love gathering, welcomes you with its elegance and beauty. The apartment looks onto this large paved square. Rocca of the Trees, the magnificent medieval walls, and the military fortress. The apartment comes with an open-plan living room and dining room, a built-in fully-equipped kitchen, two comfortable double beds, a bathroom with shower, washing machine, and tumble dryer. Fast wifi and air conditioning. Before every check in the apartment is completely cleaned and sanitized. Must climb stairs. Heavy luggage? Do not worry! We will help you with that. The apartment is walking distance to the town, its restaurants, cafés, shops, and train station. To start your day, we offer you a typical Italian breakfast, opposite the Duomo. This authentic hidden gem is the perfect location to experience slow rhythm and medieval beauty. From Italy, Padua, Verona, Vicenza, Mantua, Ferrara, as well as Lake Garda and Valpolicella. Like in the historical wonders, off the beaten track, like Arquà Petrarca and Este. Elegant Apartment overlooking Montagnana's main Square. The apartment is on the top floor. A unique and relaxing position. As you enter through one of its four arched doors, Montagnana gives you the immediate sensation of a special place. Inside the medieval walls, Piazza Vittorio Emanuele II, the place where its inhabitants love to gather, welcomes you with its elegance and beauty. The apartment overlooks this large paved square, right in the heart of the historic center. Thanks to its position it is possible to enjoy unique views of the imposing Duomo, the magnificent medieval walls and the Rocca degli Alberi military fortress. The apartment is within walking distance of the city's attractions, its restaurants, cafes, shops and the train station. Languages: Italian, English, French and Spanish To start your day pleasant, we offer you a typical Italian breakfast, to be enjoyed comfortably seated in the elegant bistro next to it, in front of the Duomo. This authentic hidden gem is the perfect place to experience the slow pace and medieval beauty. From here you can easily reach destinations known as Venice, Padua, Verona, Vicenza, Mantua, Ferrara, as well as Lake Garda and Valpolicella. Not to mention the nearby historical wonders, off the beaten track, like Arquà Petrarca and Este. We look forward to welcoming you!